It's hard to find a good slot machine to download these days. We provide an in-browser slot machine for your enjoyment, but understand that it isn't everyone who can log on to play these days, and some people may prefer a download. My slot machine download selection is small, but sweet. I have tried to cover a little of everything from educational slots programs to themed slots for pure fun. If you know of a free slot machine download on the Internet that deserves to be included on this list, please email me to let me know. If you ever wanted to know how a real slot machine works, Super Double Jackpot will show you how. This Slot Machine allows you to create and test your own odds, create and track various user statistics and see how varying odds effect the house or player advantage. Note: Super Double Jackpot is limited to 500 spins. Registration is $24.95 American. Cops & Robbers Slots is a three payline slot machine game. Up to three coins can be bet on each spin (one per payline). Winnings are based on the symbols on a winning payline, nothing special there. There are also several bonus features which make this very fun and also adds an element of skill to the game. This theme is a great example of the variety available. 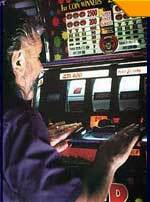 Note: The load and save functions are disabled in this slot machine download. The registration price is $20 American. FW Star is a slot machine for your PC that you play for fun. This program represents the classic German slot machine, which is somewhat different than those you might find in Las Vegas. All three wheels can be started or stopped independently by the player, and five different payouts can be won. If you prefer, you can switch between an American-style slot machine with fruit symbols on the wheels and a German version. Note: This demo is limited to a 40-day trial. Reel Fruity is a realistic Fruit machine simulator with nudges, gambles, feature wins, and lots more. Mouthwatering graphics look good enough to eat! You start the game with $50. Every time you spin the wheels your credit is reduced by $5. You can win in two ways - 3 of a kind pays the value shown on the chart. There are special bonuses for a Kiwi Fruit, Custard apple or Coconut anywhere on the winline. This fruit machine is a classic example of the genre. Note: This is a 30-day trial. The registration price is $15 American. Bingo Bonus Slots is a five reel, nine payline slot machine game. Up to 90 credits can be bet on each spin. Winnings are based on the symbols on the paylines and the credits bet per payline. A payline is only active if there is a bet on it. There is also the "Bingo Bonus" game which adds the chance to win up to 4,500,00 credits. This game shows the integration of other 'bonus' style games into the slots model. Note: This demo version is limited to 50 spins per game. Registration is $20 American. From the developer: "Sports Slots is a five-reel, nine-payline slot machine game. Up to 90 credits can be bet on each spin. Winnings are based on the symbols on the pay lines and the credits bet per payline. A payline is only active if there is a bet on it." There is also a fun bonus game screen that you can earn while playing the game. This is another example of how themeing has become so common in the world of slots. Note: Load and Save are not available in the shareware version. Musical Slots is a three payline slot machine game. Up to three coins can be bet on each spin. Winnings are based on the symbols on the payline. A payline is only active if there is a coin bet on it. There are also several bonus features. This is an example of a slot machine download with a direct theme to appeal to someone's predetermined interests. Note: This trial version is limited to 50 spins per game.